In 1977, after spending 12 years in prison on Robben Island, he was appointed secretary of the Internal Political and Reconstruction Department of the African National Congress (ANC). He served on the Revolutionary Council and National Executive Committee of the ANC, an underground program of armed resistance against the apartheid government. After Mandela was released from prison in 1990, Maharaj was a lead negotiator for the ANC in talks with the National Party government and Joint Secretary of the Transitional Executive Council, overseeing South Africa’s transition to democracy. Mandela appointed Maharaj minister of transport upon becoming president in 1994; Maharaj served in parliament until 1999. Recently, he was also the official spokesperson for South African President Jacob Zuma. Maharaj has been involved with the Institute for Global Leadership since 2006, when he first came to Tufts to participate in that year’s EPIIC symposium on “The Politics of Fear”. He has made several trips back over the years, as a participant in the Bendetson Public Diplomacy Initiative “Iraq: Moving Forward” and to share his experiences on “Nelson Mandela: Myth and the Man”, along with a book-signing of Mandela: The Authorized Portrait, for which he was an editorial consultant and contributor. In 2006, Maharaj was presented with the Dr. Jean Mayer Global Citizenship Award in recognition of his work in the peaceful transition to democracy in South Africa. 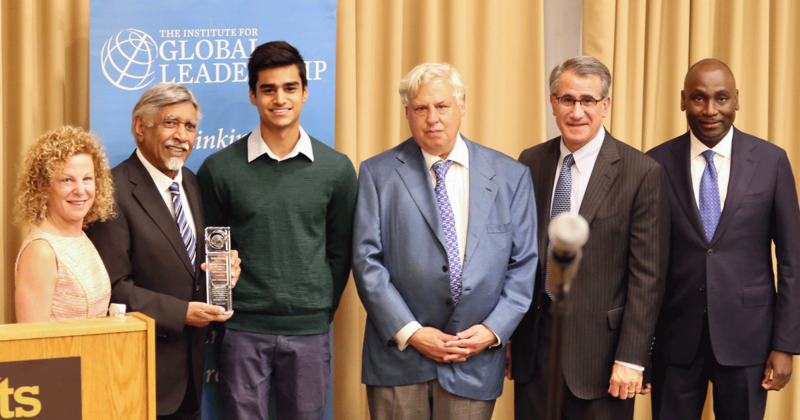 This year, Maharaj was presented with the Robert and JoAnn Bendetson Public Diplomacy Award for his continuing work with other fractured societies, from Northern Ireland to Iraq, in encouraging dialogue and understanding over violence. Maharaj spent his time with the EPIIC class addressing “Democracy in Crisis: A View from the South” as part of this year’s EPIIC theme on “Is the Liberal World Order Ending?”, and he also gave a public lecture on “The Challenge of Peacemaking and the Pursuit of Justice”. The public lecture was cosponsored by Peace and Justice Studies, the Africana Center, The Fletcher School of Law and Diplomacy, the International Relations Program, and the Office of the Provost. In speaking to the EPIIC class, Maharaj emphasized that “a better future is possible,” noting that it may be easy to get discouraged by recent global and national events. He argued that empowerment and education is not a function of institutions alone and that one way to frame current events is “it’s not whether democracy has failed, but whether we have failed democracy”. According to the students, it was a powerful class as Maharaj shared both the evolution of his thinking from his youth as an activist and fighter to his role today as a statesman and public intellectual. He ended the class with arguing that the world needs to have a “we are in this together approach” rather than a “me first” approach. Read the Tufts Daily article here! Read the Fletcher School article here!